In this post, I will show how you can connect with LinkedIn from your salesforce org using a small piece of code. So, Get ready to do another integration with Salesforce. Before we start playing with the code we need to create a Custom Setting where we will store Access Token and Expiry time so that we could use this while making the callouts. Next, Create a VF page that will do the Authorization with LinkedIn. Name it “LinkedlnoAuth“. You will get the complete code from my GitHub Repo. Copy Apex Class and VF page code From Here. Time to create a Connected App into LinkedIn developer account to get the Client Id (Consumer Key) and Client Secret(Consumer Secret). Go to LinkedIn Developer Console Create Application. Refer this link to get the complete picture of app configuration. You will get Client Id and Client Secret copy both and store in the text editor. 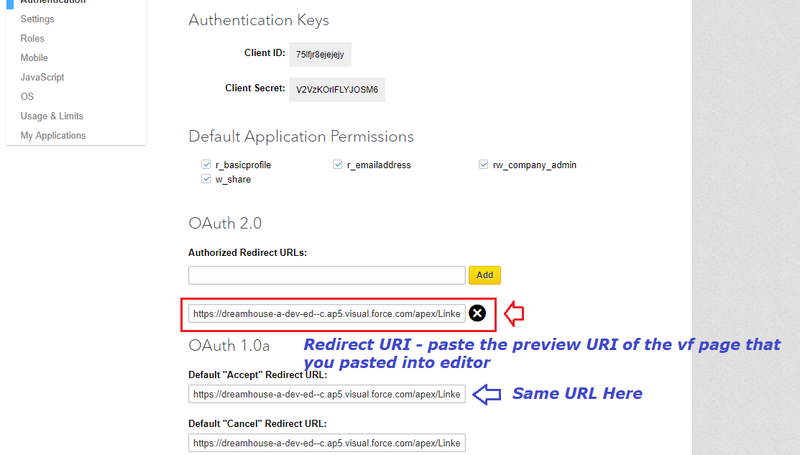 1 – Open LinkedlnoAuthController class replace redirect_URI with your VF page preview URI (line #10). 2 – Replace consumerKey with your client Id and consumerSecret with your Client Secret (line #8 and #9). Now, we are all set to let’s do some testing and see if we have successfully integrated LinkedIn with Salesforce. Enter your username and password then sign in Grant permission to Application -> Click Complete Authorization, a success message will show. Facing any issue let me know in the comment section. The Error is because the value of the access token length is 255 chars. To avoid the Error Please use Custom metadata OR custom instead of Custom Setting to store the access and refresh token and make the changes in the code accordingly. I replaced the Access_Token__c with Access_Token_1__c and Access_Token_2__c. On authentication I split the access token into two segments and stored the segments into the two attributes. On retrieval, I retrieved the token segments from the attributes and concatenated them. Just seemed easier than using metadata and having to do SOQL calls. Thought you might like to mention this step in your excellent user guide. Sure. I will add the same thanks for pointing our.